Sitting here writing, I give huge kudos to the dedicated journalists bringing coverage of the show to the general public over all four days! My feet ached, my bad ballet knees throbbed and my sinuses got drier than a desert – but let me say, it was one of the best experiences of my life. And I didn’t want to leave. First, CES is unlike any trade show or event I have ever been to – the trade show booths are so large and house a sea of technology companies all packed into two million square feet of exhibit space. 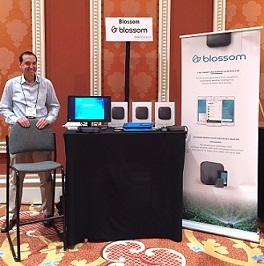 After checking into our hotel and grabbing lunch, Beverly and I headed to the ShowStoppers media event for our client Blossom, the smart sprinkler controller. Blossom had recently completed a sucessful Kickstarter crowd funding campaign, and now it was time to meet media face-to-face. ShowStoppers went swimmingly well! I had a fantastic time meeting and greeting media that stopped by Blossom’s table – especially those with whom I had worked with and we ‘knew’ each other in the way that only a PR person and journalist can connect. The highlight for me was having the opportunity to meet media in a face-to-face setting and engage in person. Sidenote: We may be an increasingly digital society and have said goodbye to paper press kits – but Dropbox is a great way to provide media with digital accessibility to one! And the business cards I gave out that were labeled with a shortened Dropbox URL indicating where to go online were a hit. The best part, however, was walking through the show floor. It was fascinating to see so many people and all sorts of tech gadgets, but it wasn’t until I came across the two-story Oculus booth that I was stunned and knew it was going to be an even more amazing experience. From Intel’s ‘booth’ looking like a movie scene out of Avatar to LG showing gorgeous images on a wall of nearly 20 TVs – I couldn’t help but be excited about what was created here. Another impressive booth was that of Toshiba with brilliant images on huge TVs, a virtual fitting salon and seemingly endless displays of every sort of technology advancement. I was especially drawn to “Toshiba Glass,” which in my opinion, rivals Google Glass with a sleek design and minimal size projection module. I’d actually wear these! Overall, drones, IoT devices and smart fitness gadgets were three product areas that stood out to me on the show floor. In fact, I just had to make a photo collage of our time at the ZANO Drone booth with our client Lantronix, whose xPico Wi-Fi chip brings life to this intelligent and compact consumer photography drone. I am part of the millennial age group – and I feel privileged to have grown up in a non-digital word where I remember green text on black computer screens, MS-DOS games, my dad having a beeper and me using my walkman for ice skating lessons. With those memories, it’s been such an interesting experience to see the world so quickly transform into one where smart devices are pervasive. 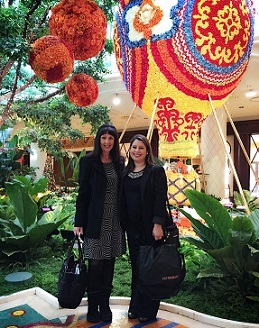 And CES was the perfect way to see it all in one place. Cisco’s Internet Business Solutions Group estimates that there will be 50 Billion connected devices by 2020 – and that is only a projection. I’ll be 30 in 2020 and can’t wait to see what it really turns out to be! There was just so much technology to see and love. Check out the slideshow below for the most interesting things I experienced. What are some of my takeaways? · Always have multiple pairs of comfortable shoes (The words ‘multiple’ and ‘comfortable’ are key). · Give yourself enough time for cab lines, since they are all really long! · Always have a schedule and print out maps to efficiently navigate the show floor – our little book o’ client locations, maps, and schedules was my Bible and worked out perfectly! Seeing innovation thrive and watching how quickly the world of tech is constantly changing is something I look forward to seeing again.